This year was the first time I have been in Tokyo during cherry blossom season. It wasn’t particularly something I was excited about — after all, in Brooklyn, spring comes just as it does in Japan and trees flower and it is beautiful. In the Brooklyn Botanical Gardens there is a Cherry Blossom festival that has turned into an absolute jam-packed affair celebrating not just the cherry blooms, but Japanese culture itself. This includes a large segment of American kids (and adults) deeply into Otaku culture: cos=play, anime, Hello Kitty, etc.. These are the same American kids that get dressed up in crazy outfits to go hang out at the Japanese owned Mitsuwa grocery store in Edgewater, New Jersey. It may be my opinion, but it just is goofy to get dressed up to go to a place where people are buying their vegetables and toilet paper, kind of like someone putting on Chasid garb to go to Russ & Daughters. I digress. 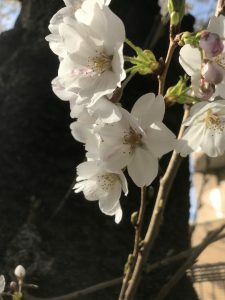 The Sakura (cherry blossoms) began blooming two weeks ago and the peak season is now over as wind and time have diminished their magnificence. I was unprepared for how much I appreciated the little pink flowers. Sakura are simply everywhere. They line the perimeter of the Army Base that is near us. 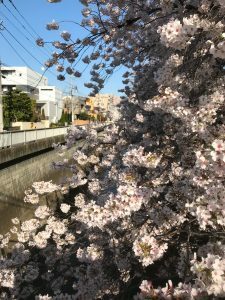 They bloom in backyards, tiny neighborhood parks with one sad slide, school yards, shrines; most of the concrete-lined rivers that snake through the city feature cherry trees whose blooms hang low, the water reflecting the delicate colors. 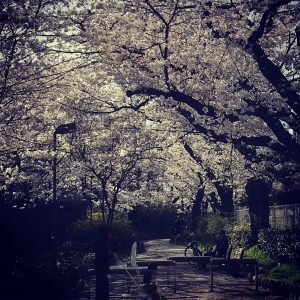 The bigger parks and certain areas like Naka Meguro are mobbed for Sakura season, hundreds of thousands of Japanese taking in the beauty, snapping photos, putting on kimono to commune with nature. These famous areas are wonderful, I am sure; but there was something special about riding my bike near the Hikaiwadai train station, turning a corner from a rather anonymous, commercial block onto a back street where a tiny, unnamed river simply exploded with Sakura, the slow-moving water carpeted in the tiny petals. I got off my bike to take in the beauty and alongside a few others taking photos, felt transported into a pre-industrial past. I have read a lot about Sakura and the cultural associations they have for Japanese people. It is said that sakura are symbolic of the transitory nature (and beauty) of life and death: the perfect blossoms erupting into perfection and just as quickly succumbing to their fragility, falling to the ground in a gust of wind. These are real associations based on philosophical strains of Zen Buddhism and the folklore of Shinto and woven into the fabric of Japanese aesthetics and thought. Deep waters to wade into. The day-to-day reality of sakura worship is the Hanami. Hanami is essentially a sakura viewing party. All over Japan during Sakura season families, friends, company employees and school mates gather by cherry trees to take in the sight, relax, play, eat and drink. And then drink some more. And when finished, to drink even more than that. 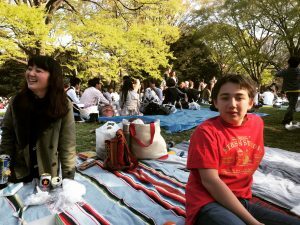 I was invited by some old friends to my first-ever Hanami at Yoyogi park in Shibuya. It is the largest green space in Tokyo. I have been to Coney Island beach in August; to Central Park during Summer Stage; to the shores of Lake Michigan on the hottest day in Chicago. Nothing has compared to the sheer amount of people doing Hanami in Yoyogi Park. Every available space was pretty much taken — a few shaded areas far from the Cherry blossoms allowing for a frisbee to be tossed. The lines for the few available bathrooms were unbelievable, snaking down the paved paths ad infinitum. (As an aside, Japanese people are very good at waiting in long lines be it a popular ramen shop, a bathroom or trendy restaurant. They seem to enjoy the process.) Teenagers, multi-generational families, groups of tourists all hunkered down on spread mats and cracked open cold beers, bottles of whiskey, shochu mixed with fresh-cut lemon, carafes of sake. Gas burners were lit with bubbling crocks of hot pot, ramen, udon; skewers of yakitori grilled throwing plumes of fragrant smoke; hungry folks tucked into elaborate bento boxes of sushi, fried chicken, meats, nori and rice; endless snacks were carefully opened to compliment alcohol — chips, dried squid, rice crackers, smoked cheese, soybeans. Kids munched on sweet mochi, cookies, ice cream, chocolate poky. A would-be catastrophe of trash. I shudder to think of how this scene would have played out in Brooklyn, in Prospect Park. Incredible crowding, excessive and open-air drinking, limited restrooms and open flames. I daresay it would erupt into a riot of free-for-all urination, gunshots, fist fights, public fornication and the mounted police being called in. At the very least, the aftermath would be wholesale littering made up of discarded chicken bones, cans, cigarette butts, used condoms, plastic bags hanging in the trees and endless Dorito bags fluttering in the wind. Not so in Japan. I didn’t witness a fight; no one pulled out a gun. Even the drunkest groups managed to tidy up their areas, collecting their trash, their used cigarette butts in plastic bags, wrapping it all up to take home and discard (I forgot to mention that there is basically no trash cans in any of the parks). True, I saw some men peeing in the trees and I hustled my own daughter deep into the bushes as there was no way she was waiting an hour to relieve herself. My son did witness a few puking incidents and there were some passed out revelers along the pathway. With the exception of some stern elderly men (park volunteers?) keeping an eye on things, there was no authoritarian or Police presence. People regulated their own behavior. There was a lot of flirting however! While Japanese people are not particularly comfortable with public displays of affection, I did see a lot more cuddling and hand-holding than normal. And the teenagers seemed to be lustier then ever with roaming packs of girls and boys checking each other out and exaggerating the effects of a few beers. The sense of rampant hormonal tension was in the air. I suspect that a lot of babies are born in December. And maybe that is part of the point. Spring is a celebration of fertility, of re-birth and while it was lovely to see a whole society take a day to just take in the wonders of nature, it was just as nice to see a kind of Dionysian Bacchanalian vibe take over. As I have pointed out before, Japan’s population is plummeting to a dangerous level. People need to have some babies. And what could be better, in the glow of lush cherry trees shedding their petals like snow, to follow what should be Japan’s new adage: Less Work and More Doing It?